Oversize issues of September magazines, end of summer sales and fallen leaves on the sidewalks -all signs that we are on the cusp of the seasonal switch. In order to make the transition to autumn more bearable it is helpful to add a few fun pieces to freshen up your home and wardrobe -- from simply switching out the finial on a lamp, spicing up a room with a graphic x-bench, to investing in a luxurious throw to help welcome the cooler evenings. Completely adoring that X bench. Such a great print! That throw is great. Such pretty colors and a playful print. Love it ALL especially the Jason Wu clutch! Great items! Zebra x-bench looks funny and elegant at the same time! 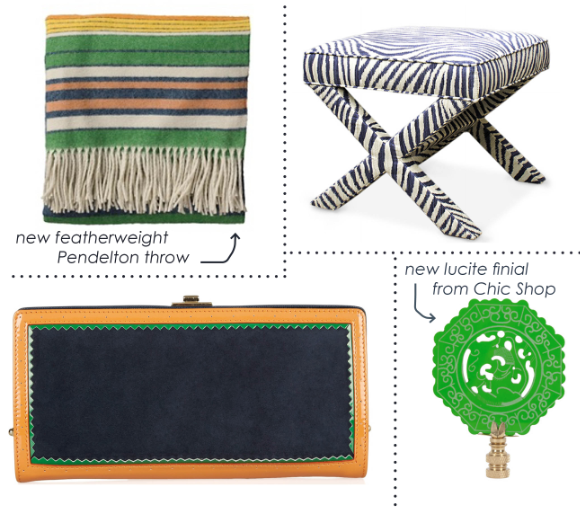 Loving these colors...the Pendleton blanket is great!! I'm amazes to see this post guys.